New Delhi: India is witnessing a revival in investment activity after several quarters of downturn, putting the nation’s economic recovery on a surer footing, Reserve Bank of India (RBI) governor Urjit Patel said at the International Monetary and Financial Committee meeting in Washington DC. “There are now clearer signs that the revival in investment activity will be sustained. Global demand has been improving, which should encourage exports and boost fresh investments. On the whole, real GDP growth is expected to expand at 7.4% in 2018-19, with risks evenly balanced," Patel said, speaking on behalf of finance minister Arun Jaitley, who missed the spring meeting of the International Monetary Fund due to health reasons. Patel’s remarks come just days after India’s weather office forecast a normal monsoon, which could not only mitigate farm distress but also boost overall demand. 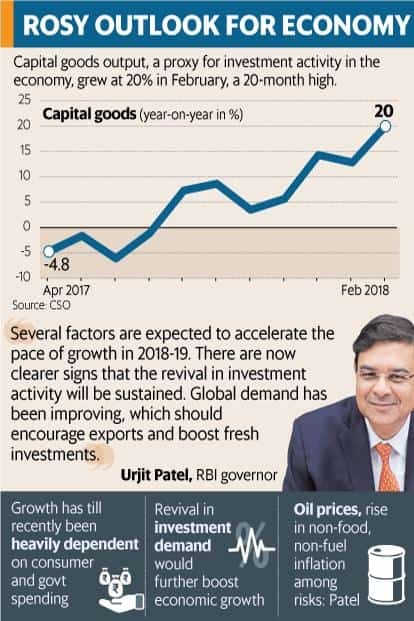 The pick-up in investment activity at a time when rainfall is expected to be normal will further aid economic growth, which slowed down in 2016-17 to 6.6% because of disruptions related to demonetisation and the implementation of the goods and services tax (GST). Private investment activity in India has been bogged down by excess capacity and firms’ stressed balance sheets. Economic growth has till recently been heavily dependent on consumer spending and public investment by the government. However, capital goods output, a proxy for investment activity in the economy, rose for the seventh straight month in February at 20%, the fastest pace in 20 months. The central bank in its 5 April monetary policy statement noted that home loans extended by banks have increased significantly, a positive for residential investment. Mahindra Group chairman Anand Mahindra on 19 April tweeted that he sensed a demand recovery based on the feedback that he got at a quarterly group executive board meeting. “The Takeaways: 1) Across the board, strong demand recovery except in urban, premium real estate 2) Strong liquidity amongst consumers esp. in rural areas. 3) Production capacities stretched 3) Domestic tourism growing strongly 4) IT companies have made a robust transition to digital," he said. In its biannual World Economic Outlook, IMF kept its GDP growth forecast for India unchanged at 7.4% for the year to 31 March and 7.9% in the following year, holding that economic activity will be lifted by strong private consumption as well as fading effects of the demonetization of high-value currencies and implementation of GST. “Over the medium term, growth is expected to gradually rise with continued implementation of structural reforms that raise productivity and incentivize private investment," it added. The Asian Development Bank and the World Bank have projected the Indian economy to grow at 7.3% in 2018-19. Patel said several factors are likely to influence India’s inflation outlook, including a possible moderation in food prices if the monsoon turns out to be normal and is supported by effective food supply management. “Countervailing this, upside risks emanate from the distinct hardening bias in crude oil prices, the steady firming up of inflation ex-food and fuel mirroring pick-up in domestic demand, and spillovers from financial volatility as markets re-price the path of monetary policy normalization by systemic central banks," he added. India’s retail inflation decelerated for the fourth consecutive month in March to 4.28%. RBI has lowered its inflation forecast for 2018-19 to 4.7%-5.1% in the first half and 4.4% in the second half. The central bank has a mandate of achieving the medium-term target for inflation of 4% within a band of +/- 2 percentage points, while supporting growth.